Feed starving animals and people in this awesome physics based puzzle game! Shoot through 24 challenging levels in this addicting game. 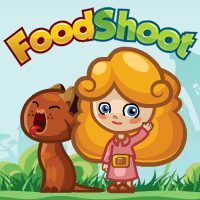 Use your mouse to click and drag on the cannon, release and shoot the food into the animals & humans mouth. Make sure you look to see what the food is, because little girls apparently don't like to eat spiders!